I don’t usually download apps because in my opinion it just takes up too much space and battery energy. But recently I’ve downloaded a couple apps that I’m sure to be obsessed with in 2018 a couple of them are for language learning and one of them is for my kids but I find them really fun to use and I think I’m going to be using them for a long time so I wanted to share them with you! This is not a new app but I hadn’t really heard about it until recently thanks to Kourtney Kardashian‘s Insta stories I decided to download Duolingo to help sharpen my French. The app is a pleasure to use very beginner friendly has very little ads and they aren’t annoying and spammy looking. Plus, I really do learn a lot from the app. You practice a little bit every day and help sharpen your French girls it’s not overwhelming and it’s really easy for me to to do every day. I highly recommend that you download it and give it a try. Tinycards is a different app that teaches you language vocabulary to help sharpen your skills in Duolingo. You can also learn about tons of other things like geography the human body, history, music, etc. it’s really fun and educational. I absolutely use this app every day. Marco polo is a video chatting app it’s like Snapchat only it’s direct there’s no feed you can’t post stories it’s just direct video chatting and to me it’s the fastest most convenient way to video chat versus video chatting on Facebook or sending videos to your family via message or however people video chat nowadays I definitely consider Marco Polo to be the easiest however once you press start on Marco Polo you can’t pause or restart your video so once you hit start you better be ready to record. This app has been particularly helpful keeping our family together our in-laws are on the other side of the country in California and we have been able to chat with them almost daily and it’s really fun a lot easier than email and snail mail and I just I definitely will be using this app a lot in 2018. In my attempt to be more minimalistic and less wasteful I’m trying to cut down on our usage of paper so I’ve been downloading math apps for my girls on my iPhone I found this app called MathCards and it’s perfect for my daughter she’s in the third grade and it helps drill her in multiplication division addition and subtraction it’s very simple user-friendly and she’s learning a lot from it. All of the apps mentioned above are free of charge which is also amazing and they are all available on Apple I do not have an android device so I cannot say whether they will all be available on android but I love them all and I will definitely be using all of these apps in 2018. 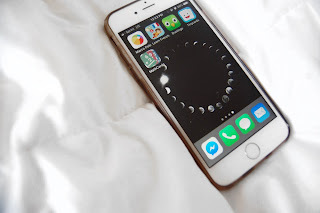 Are there any apps that you absolutely are in love with I would love to hear about them because I love downloading find new apps to my phone. Let me know in the comments!